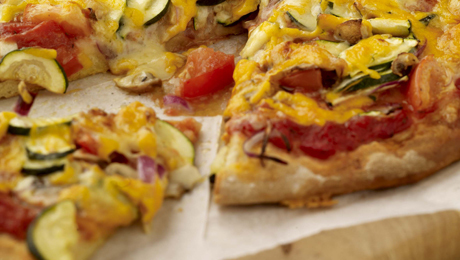 This is a delicious recipe for a quick and simple pizza without having to use a yeast base. Play around with this recipe using whatever toppings you like. Sieve the plain flour into a large mixing bowl with the bread soda and the salt. Add in the buttermilk and mix it together to achieve a sticky dough. Transfer the mixture onto a lightly floured work surface and knead gently, then press onto a flat greased baking tray (you can use a round or rectangular tray). Mix together the tinned tomatoes and dried mixed herbs and spread this over the base. Then add on the other toppings and finally sprinkle over the grated cheese. Cook in the preheated oven for approximately 20 minutes until the base is cooked through and the topping is golden brown. Serve immediately. Delicious served with a crisp salad and garlic bread. A most excellent idea. I usually make my pizza dough from scratch, but this takes a couple of hours as the dough needs time to rise. Try this with a home made organic pesto on the soda bread, then add toppings of your choice.